WEIBER has emerged out be a successful supplier and manufacturer of medical refrigerators and blood bank refrigerators. And now we introduce here solar powered editions of refrigerators. WEIBER Solar Medical Refrigerator is one such application, using solar energy to convert to electrical energy to freeze the refrigerator. It is available in various sizes of 37.5Lt, 60Lt, 85Lt, 128Lt and 168Lt to meet our customer’s needs. 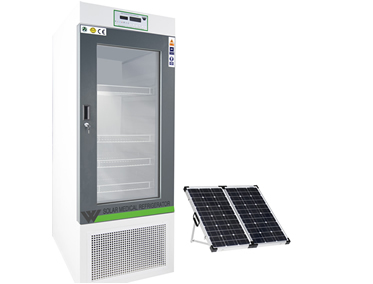 We also customize Solar Pharma Refrigerator according to different requirement of capacity and ranges. The refrigerator also known as Solar Pharmaceutical Refrigerator. Solar power is the latest trend in technology to minimize the need of electrical energy generated. And even in rural and low lying areas where electricity does not reaches, the use of electrically operated refrigerators create a problem. A solution to such problem are solar refrigerators that freeze through sunlight, and when sunlight is not present then through biofuels. Alarm at faults: perfect alarm system that provide numerous audible/visual alarm functions in case of high or low temperature conditions, faults, door ajar. Fully hermetic domus compressor with integrated control electronics. Connect with DC power source directly e.g. solar power source. Connect with AC power source through an AC/DC adapter. Electronic fuse, automatic reverse voltage protection. Automatic turnoff when voltage is low. Strong lid, hinged with silicon and lockable: it gives complete access to the refrigerator in an easy manner, easily openable with less force and durability of silicon gasket is more which reduces temperature loss. Built in forcing ventilation system. CFC free cooling-the air cooled refrigerators use refrigerants that are chlorofluorocarbon (CFCs) free, thus are ozone friendly and eco-friendly. The solar panel converts sunlight into DC power or electricity to charge the battery. This electricity (charge) is controlled via a charge controller which ensures that battery is properly charged and not damaged. DC appliances can then be powered directly from the battery. Method 1. Accessory: AC/DC adaptor. The DC refrigerator can be powered by AC power (standard wall plug in a home or office). This allows the refrigerator to be powered using conventional wall outlets and the unit can work without solar panels, batteries or a charge controller. It is important to note that our units operate with as little as 60W. Method 2. Accessory: solar panels, battery, charge controller. 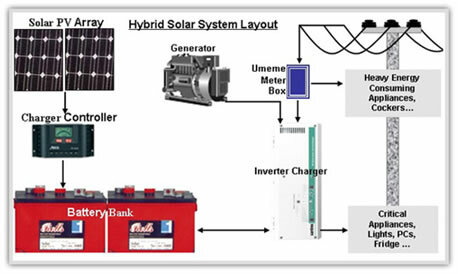 The solar panel converts sunlight into DC power or electricity to charge the battery. This electricity (charge) is controlled via a charge controller which ensures that the battery is charged properly and not damaged. The solar refrigerator/freezer can then be powered directly from the battery. Method3. Accessory: charge controller, solar panel, battery, AC/DC auto transfer switch, AC/DC adaptor. This method combines method 1 and 2. 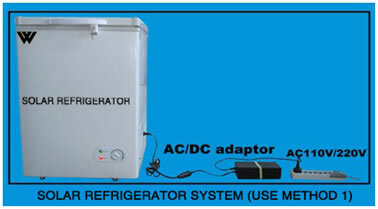 By adding an AC/DC auto transfer switch, the refrigerator can operate using AC power. This is useful when the battery is discharged due to multiple rainy or cloudy days. When the battery can't provide needed electricity, the auto transfer switch can automatically switch to AC electricity (110V /220V). 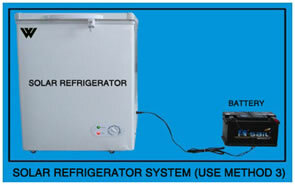 When the battery is recharged, the refrigerator will go back to DC solar power (12V/24 V). 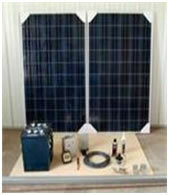 According to the capacity of the refrigerator chosen, we provide the solar power kit of 2 panel, 4 panel, 6 panel etc. on customers request any component can be changed. The battery most commonly used is the lead acid type, long life, deep cycle batteries are preferred. A capacity to run the refrigerator for five days without sun is recommended. The automatic switch allows for power priority. If plugged into the DC port, the battery has priority. The system will operate using DC (battery power) and will only switch to AC power if the battery is exhausted. If plugged into the AC port, the system will operate using AC power and will switch to DC power (battery) only in the case of a power outage. The DC port is preferred as this does not cost any money to operate. WEIBER solar medical refrigerators have Outer body constructed out of thick PCRC, pre coated corrosion resistant GI sheet duly pre-treated with primers and rust proofing and paintedwith long lasting stove enamel or elegantly powder coated The inner construction is made of heavy gauge stainless steel sheet of SS-304 grade). The gap between the walls is filled high grade mineral glass wool, which ensures maximum thermal efficiency in our refrigerator. It contains single door. This door is provided with magnetic door closer. This door is provided with lock and key arrangement. An energy efficient cooling unit is installed in our solar medical refrigerators. We use high end CFC free compressors of Kirloskar/Tecumseh / Bitzer/ Danfoss make, conforming to latest international standards and guidelines. HFC’s. Temperature from 5 to -20°C can be achieved by using R-134A. Insulation: The gap of 120 mm between the outer and the inner wall is filled with special grade glass wool to prevent thermal losses.